After a nice bank holiday weekend of sun and fun, what better way to step into the weekday of drizzle than something to remind us that summer is on the way. Out on 15th July courtesy of Mensch Film sand Proper Distribution, is the Robin Mahoney feature Glastonbury The Movie in Flashback. Arriving on DVD, Blu-ray and download, the former will also come as a Special Limited Edition 4 disc set that includes 1996 feature Glastonbury The Movie, a multi-angle disc with 3 different cuts and 8 different soundtracks, and an extras disc that has trailers, promos, interviews, short films, stills, State Within a State documentary, Avalon documentary and The Miniscule of Sound featurette. That DVD release also comes with a large double sided poster, 8 page booklet and packaging designed by Airside. Alas we have no retail price for this version. Both the standard DVD and Blu-ray releases will set you back a mere £16.99, presented in a 1.235:1 aspect ratio, with 5.1 Dolby Digital, DTS and Dolby Stereo soundtracks. Iconic and unique, Glastonbury is the legendary forerunner of music festivals. Over the years it has become a rite of passage for millions of British youths and an essential annual pilgrimage for hundreds of thousands of fans. Beautifully shot in epic CinemaScope this new film, created from over 100 hours of previously unseen material, spins back the years and drops you head first into the best of Glastonbury. If you were there you’re in it and if not you’ll wish you had been as you are immersed in a no-holds-barred trip through music, magic and midsummer madness. 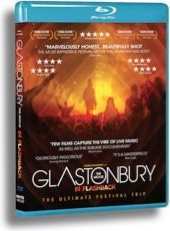 Glastonbury The Movie In Flashback is a must-see for all festival fans. The definitive film about the festival that started it all.